I love almonds, from marzipan, frangipan, macarons, amaretto and bakewell tart to these almond danish pastries. So many of my favourite recipes and ingredients contain almonds. Although I’ve already made cronuts this week, I thought I would visit viennoiserie again for Breakfast Week. I’ve made danishes before and I really love this leavened laminated dough. This isn’t a surprise as puff pastry is one of my favourite pastries and danish pastries are simply puff pastry with yeast added. Pastries are a great breakfast item, I personally think they should be saved for one of those mornings when you can really take time over them, brew a pot of coffee, have them warm from the oven with sticky icing or glaze over the top and snuggle down into your dressing gown with the papers or nowadays your tablet and an online paper. 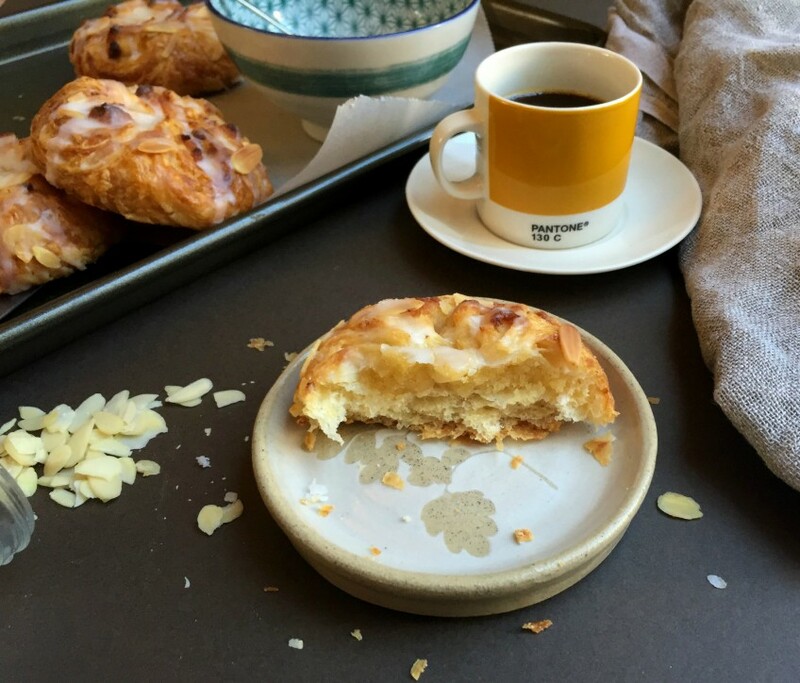 These almond danish pastries have an almond paste inside them, they’re sprinkled with flaked almonds and then finally I used this flavoursome almond extract from Kings Fine Food to create a delicious almond glaze. 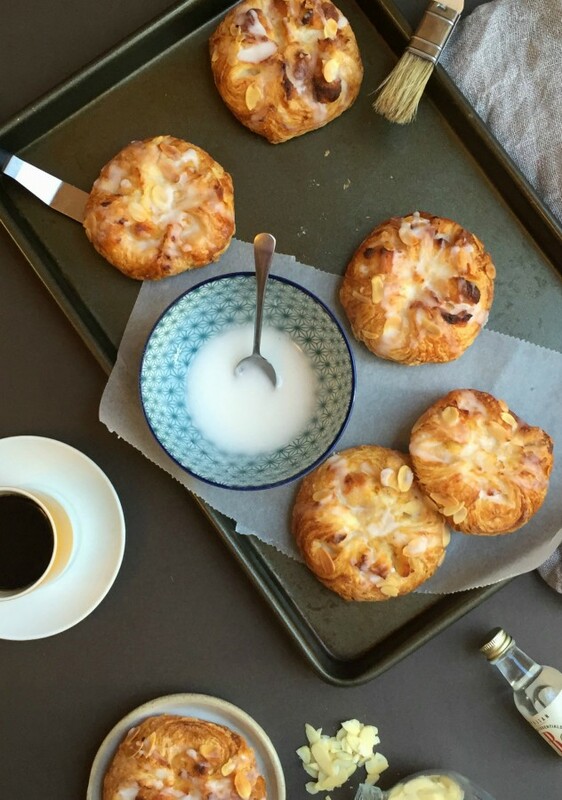 This recipe makes 16 almond danish pastries, however I froze all of my danishes before their final prove and then defrosted them overnight in the fridge and allowed them to prove at room temperature for a couple of hours in the morning. This makes the recipe much less time consuming as I still have 8 of these danishes lurking in the freezer for me to cook at a later date. I love freezer recipes like this and regularly make sure I have pastry in the freezer should any occasion arise. Detailed information on how to make danish pastry along with pictures of the folds are included in this post. 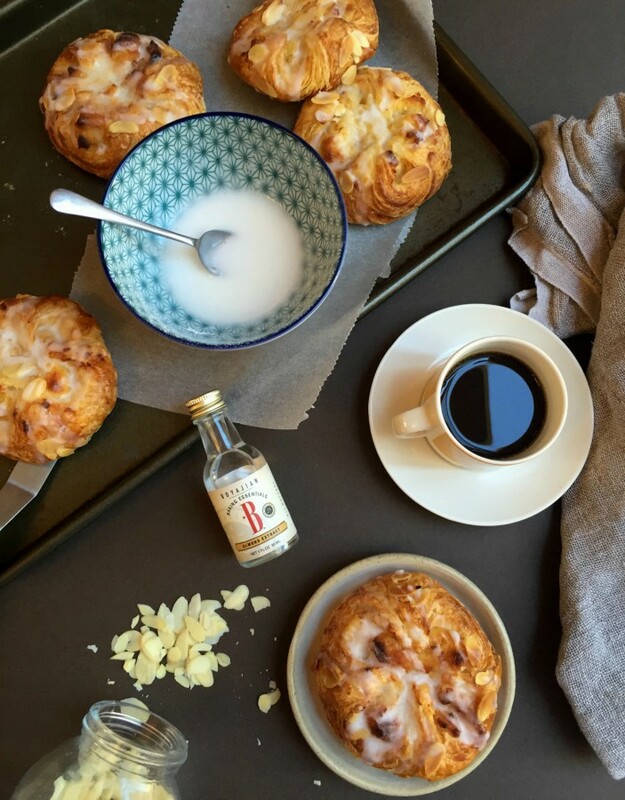 It may seem complicated, but it’s just takes a few minutes every other hour and you’ll have amazing danish pastry. The pastry is rolled out into rectangles and these are cut to make 16 squares, small teaspoons of mixture are added to the centre of the pastry and the four corners are folded in to meet in the centre. This is the point where you can place the pastries on a baking tray or board and lay them flat in the freezer. Once the pastries have frozen you can pop them in a ziplock bag that is dated and marked up with details of the contents. These will be fine in the freezer for a couple of months. If cooking the almond danish pastries straight away, place them on a tray lined with baking parchment, cover them lightly with clingfilm and place them somewhere warm to prove for around two hours, until they have doubled in size. When ready to cook, brush the pastries with egg wash sprinkle them with flaked almonds and bake them in an oven at 180C fan for 15 minutes or until golden. I found my pastries needed a little longer. Then allow the pastries to cool for a few minutes before dribbling the almond glaze over the top of the pastries. The glaze is a mixture of almond extract, icing sugar and milk that adds another almond hit to this packed recipe. 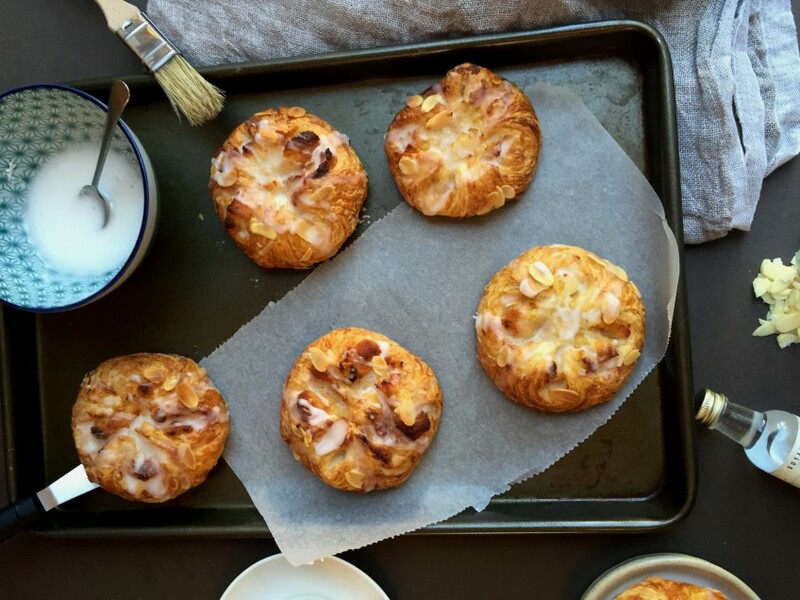 This is a recipe for a delicious almond danish pastry complete with an almond glaze. Place the flour, sugar, salt and powdered milk in a large bowl. Crumble in the yeast, making sure it doesn't touch the salt. Add the egg and the water and knead with your hands until the dough is firm, it will be quite dense at this point. Add the softened butter and knead until it is fully mixed in. Knead the dough until it is smooth and elastic. Shape it into a ball, cover with cling film and place in the fridge for at least 2 hours. Ten minutes before your pastry is ready to come out of the fridge, place your remaining block of butter in the freezer. On a floured surface roll out the dough to a rectangle that is 6mm thick. Place the butter between two pieces of greaseproof paper and roll it out into a rectangle half the size of the dough.Arrange the dough so a short edge is facing you and place the butter on the bottom half of the dough. Press the edges of the butter into the dough with your fingers. Fold down the top half of the dough to completely enclose the butter. Turn the dough 90 degrees clockwise. Roll out the dough lengthwise until it is 7mm thick. Fold up the bottom third of the dough, fold the top part of the dough down so it touches the edge of the dough. Then fold the dough in half, encasing the edges so that they are on the inside of the fold. You should now have four layers of dough, if you look at the side. Cover in cling film and place in the fridge for 1 hour. Take the dough out of the fridge, roll it out to a rectangle about 7mm thick. Fold the bottom third up and the top third down to cover the bottom third, like a letter. Cover with cling film and chill for 1 hour. Combine the ground almonds and icing sugar in a medium bowl. Add the milk and egg yolks and beat with a wooden spoon to make a firm paste. Take the dough from the fridge and cut it in half so that it is easier to work with. Wrap the other half in clingfilm and return it to the fridge. Roll out half the pastry into a rectangle that is 32cm by 16cm approximately 4mm thick. Cut the rectangle in half lengthways so you have two 8cm by 32cm strips. Using a sharp knife cut each rectangle into 8, 8cm squares. Place about 1 tsp of the almond paste into the centre of each square, fold the corners of the pastry into the centre and press the almond paste down. This should give you squares with loosely open corners. Repeat the same steps with the other pastry in the fridge. At this stage you can place the pastries on a baking tray and let them prove for around 2 hours, or you can freeze these pastries for baking at a later day. If freezing, freeze the pastries flat on a baking tray and when frozen, place them in a ziplock bag. When you come to cook the pastries allow them to defrost overnight in the fridge and then prove them for 2 hours in a warm area. When the pastries have doubled in size, brush them with an egg wash and scatter them with flaked almonds. Cook the pastries for 12 to 15 minutes at 180C until they are golden brown. Allow the pastries to cool on a wire rack and make the almond glaze by mixing together the icing sugar, milk and almond extract until they form a smooth glaze. 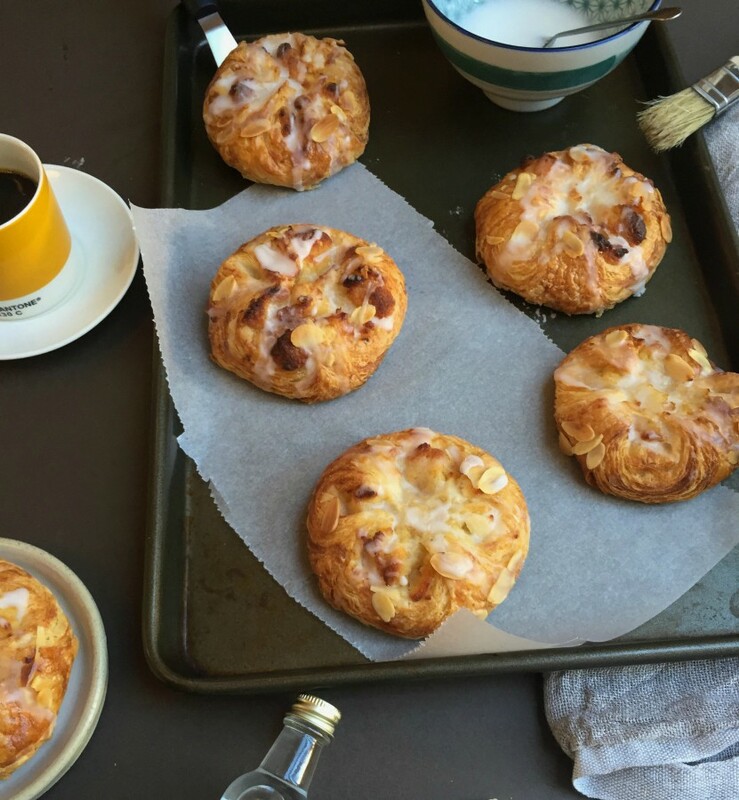 Drizzle the glaze over the top of the danishes and allow them to cool. What’s your favourite breakfast? Do you like danish pastries? Give these a go, they’re delicious. The almond extract referenced and photographed in the post was given to me as a gift by Kings Fine Food Ltd.
Hi Maria, thank you so much! I’m so pleased you like my blog. I think brown butter would work, but make sure it’s no longer liquid as it may upset the texture of the pastry and you don’t want it too hot as it will kill the yeast and affect the rise. Try to let the brown butter cool so that it sets and then use it, but don’t refrigerate it, use it at room temperature. Hi Angela – I have a fan oven, so this is 180C in a fan over. Good luck with them. I’ve never had French toast Jodie! Can you believe it? That Pantone mug is a set of 4 for espresso that I got for my birthday a long time ago, I love them too. How do you put cream cheese inside a piece of toast? You’ve never had French toast?!! And you live much closer to France than me! 😀 LOL, I wonder if French people even eat French toast? My kids usually make it for me on Mother’s Day. As for the cream cheese, you layer it between the pieces of toast, sort of like a stack of pancakes. I like mine drenched in maple syrup! I’ve seen French toast everywhere since this comment! I love maple syrup! Thank you, that means so much as I find your blog beautiful. Thanks for stopping by to comment.